The revelations about how much the BBC pays its top presenters dominate the front pages. "Bloated Blokes Club" is the headline in the Daily Mirror, which points out the corporation's seven highest earners are all white men. The Daily Mail warns of "mutiny" among female staff over the pay gap between men and women. The Times agrees that the BBC "faces a revolt" because of the gender divide. The paper says the broadcaster could end up spending millions more in wages to placate "angry" female talent. 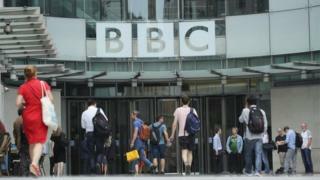 The Daily Telegraph says the government wants the BBC's top male stars to take a pay cut of 10% to help close the gap. According to the paper, the corporation has been warned it has three years before the next Charter Review to "get its house in order" and make progress on equality. The Telegraph quotes an unnamed source at the culture department who says ministers could lower the threshold and force the BBC to publish the name of every broadcaster who earns more than £100,000 if changes are not made. In its editorial, the Guardian argues that while poring over the details of celebrities' salaries is "utterly fascinating" to the public, it does not "contribute much at all" to the public interest. Far more shocking, the paper says, is the gender pay gap which should "make the bosses hang their heads in shame". A man being paid up to 10 times more than a woman working in the same sphere is "unforgivable, it says. The Daily Star takes a different approach, accusing "overpaid BBC luvvies" of "having hissy fits" after the figures were revealed. The Sun illustrates the story with a full-page photo of the BBC Breakfast sofa, with presenter Dan Walker - who is on the list of the highest-paid stars - sitting next to colleague Louise Minchin, who is not. The headline: "Awkward". The paper says it has seen intelligence reports that suggest more than 40,000 civilians were killed in the battle to retake the city of Mosul from the Islamic State group - far more than previously thought. The documents said thousands of people were killed - by air strikes, by IS militants and by the Iraqi forces trying to drive them out. An Iraqi minister tells the paper there is evidence of a "hidden massacre" with the bodies of many of those who died still buried under rubble. Fidget spinners - the playground toys that have been banned in some classrooms in Britain - are an unlikely source of concern in Moscow, according to the Times. The paper says the spinning toys are being investigated by the Kremlin in case they are "anti-Putin". Russia's consumer protection agency is looking into claims that they could be used by anti-government activists to "brainwash" recruits with hypnosis. The Kremlin is said to be "unnerved" after large numbers of students turned up to support an anti-corruption campaigner who used his fidget spinner while appearing in court.